Dove apologizes for ad that shows black woman turning into a white woman. 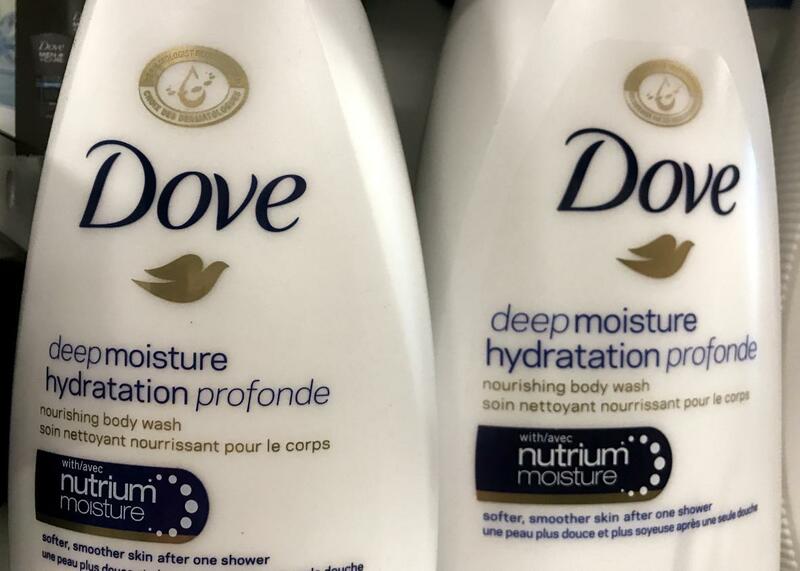 Two bottles of Dove’s Deep Moisture body wash are displayed in Toronto, Ontario, Canada, October 8, 2017. Dove is apologizing for an ad it deleted from its Facebook page that “missed the mark in thoughtfully representing women of color” as part of an advertisement for body lotion. That is most certainly an understatement. The ad that had many people accusing the company of racism showed a black woman removing her shirt to reveal a white woman underneath. The reason that the transformation of a black woman into a white woman stuck such an unpleasant chord was that it seemed to make blatant a process that the beauty industry often more subtly alludes to. Many beauty products are hinged upon the ideal of whiteness. This can be anything from the obvious—things like skin-bleaching products, the preference for hair that hangs down and the prevalence of products to support that—to the less obvious beauty norms such as red lipstick and rouge, both of which promote the pink tones common in white skin but not in black or brown complexions.